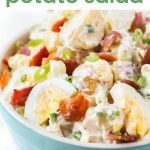 BEST Pressure Cooker Potato Salad Recipe - with bacon and eggs! 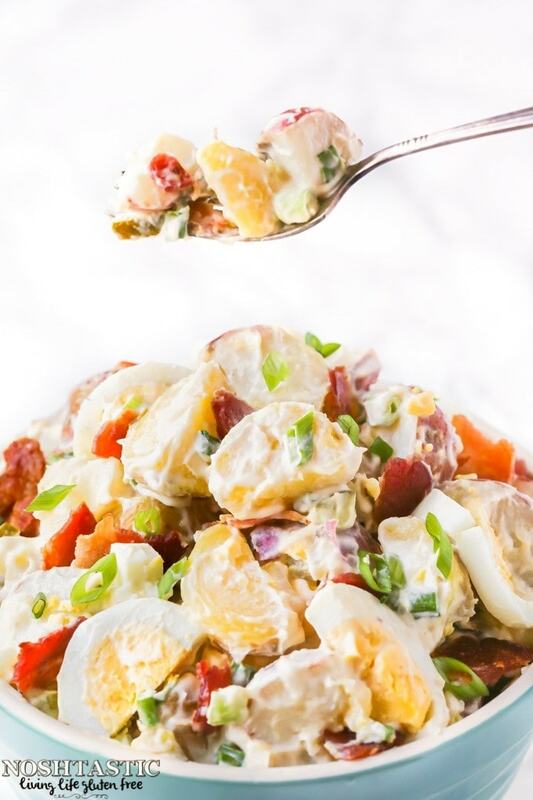 Pressure Cooker Potato Salad is so simple to make because you can cook the eggs and the potatoes at the same time which means it’s cooked in about ten minutes! 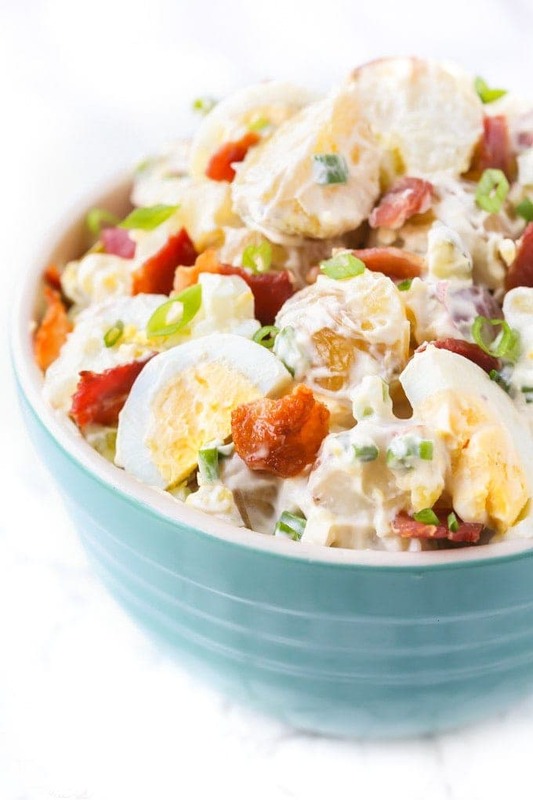 This is my own recipe for Bacon and Egg potato salad that I’ve been making for years, but I’ve now adapted it to work as a pressure cooker potato salad so that I could make it in my Instant Pot instead of on the stove in two separate pans. On the stove the potatoes and eggs have a different cook times, but we can make it all in one in the pressure cooker! My top tip is to choose a waxy potato for your pressure cooker potato salad. Waxy potatoes hold their shape better and tend not to fall apart in the same way that a more fluffy potato like russets do. We used small waxy baby potatoes for this recipe. It’s important that you cut your potatoes relatively small so that they will cook along with the eggs. I used baby potatoes and cut them in quarters. To get the best crispy bacon cook it on a rack over a sheet pan in your oven at 375 until it’s fully crispy, it will cook more evenly than in a pan on the stove and will get good and crispy as the bacon is not sitting in the grease. It will take 20 minutes or more to get fully crispy. Pressure Cooker – You’ll need a pressure cooker to make this recipe, there are many brands that will work well but we are big fans of Instant Pot! Sheet Pan – I like the Nordic Ware brand, they’ve held up really well for me. Sheet Pan Rack – I don’t know why I waited years to get a rack for my sheet pans but I LOVE it! It makes cooking a pan of crispy bacon a breeze! Pressure Cooker Potato Salad with Bacon and Eggs is the perfect side for lunch, dinner, picnics, pot lucks, you name it! Cut the baby potatoes into quarters. Add 1 cup of water to the pressure cooker then add the potatoes into a steamer basket and place the eggs on top of the potatoes. If you don't have a steamer basket just put the potatoes on top of the water. Lock the lid, turn the steam release vent to 'sealing' and using the 'manual' or 'pressure cook' button, adjust it to cook for 4 minutes. When the cook time time is up carefully open the steam release vent right away (quick release) and then remove the lid. Place the eggs into a bowl of iced water and remove the potatoes from the pot and allow them to cool in the fridge. Cut your peeled hard cooked eggs into smallish pieces and add to the bowl with the potatoes. mix the mayonnaise with the salt, pepper, mustard, garlic powder, and dill pickles. Add the mayonnaise mixture to the potatoes and egg and fold in together along with the chopped bacon. Serve chilled and garnish with green onions. We made your potato salad for our cook out last weekend, really easy to do in my instapot and we loved it, thanks! !